This text bridges the gap between general and special education pedagogy by including constructivism, humanist, social-cultural, and multicultural points of view. Through case studies and discussions, you will see students experiencing success using student-centered curriculum approaches, thematic teaching, multi-age grouping, peer-mediated instruction, multicultural curriculum, authentic assessment, and much, much more! The book includes "thought pieces" presenting main issues and questions brought about by new perspectives. Each thought piece is followed by practical ideas to improve classroom instruction. 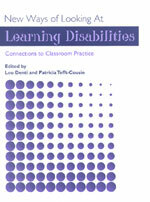 It also shows how to access perspectives from the students who are being taught. It allows teachers to know how their students learn best and how to plan curriculum for them. You will find a whole new approach to teaching in this book.